After 482 miles/775 kilometers, 42 days, 2 blisters, 6 pairs of shoes, 4,800 pictures, 14 pounds in my backpack, 2 shirts, a sweater, rain gear, 2 pairs of pants, 4 pairs of socks, and a 1 ounce tube of toothpaste, I made it to the destination that hundreds of thousands of pilgrims have been walking to for over 1,000 years. 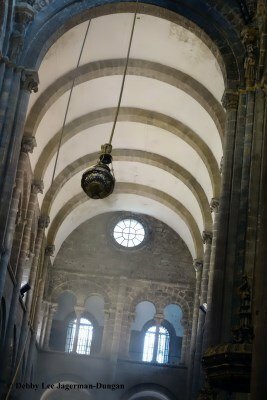 The Cathedral in Santiago de Compostela. 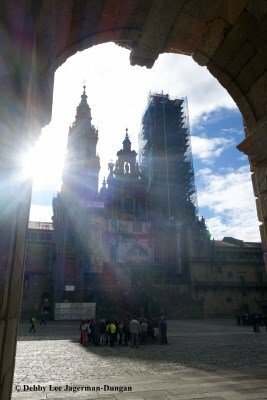 My last day of walking the Camino Francés was only 6.5 miles by design. 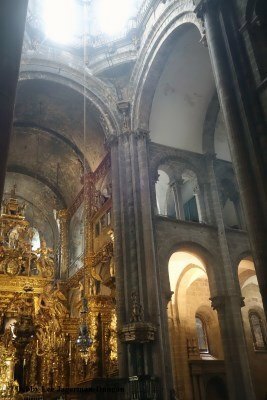 So that when I arrived at the Cathedral I could appreciate all that I have seen, experienced, eaten, and accomplished in my days of walking across northern Spain. 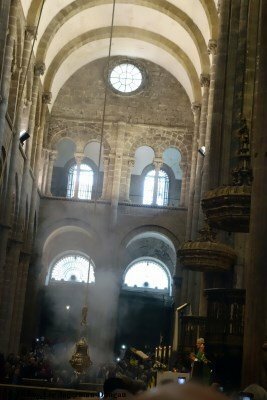 So that I could relish in this grand cathedral, the place where people pay homage to the shrine of Saint James the Great, one of Jesus’ 12 apostles. So that I could spend the rest of my afternoon walking around outside and inside a marvelous piece of architecture and art. And so that I could attend a Pilgrims’ Mass. 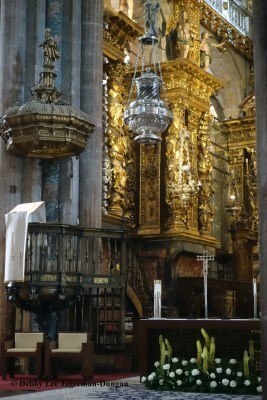 The main event that pilgrims attend once they reach the Cathedral, whether after 60 miles, 482, or more, is the Pilgrims’ Mass, usually held at noon, and at other times each day, with some services given in Spanish, others in English. An hour long service and celebration of giving thanks for the journey. The number of pilgrims who have arrived in the past 24 hours are read aloud, including where they started their pilgrimage from, and the country they live in. 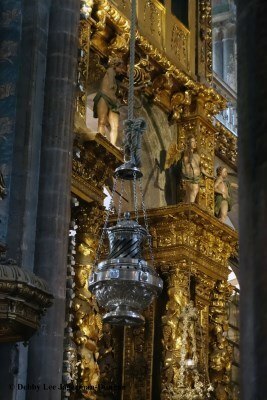 At the end of the Mass, the one tradition that has happened since the 12th century, that everyone looks forward to today, is the swinging of the Botafumeiro, a silver-plated brass container filled with burning incense. 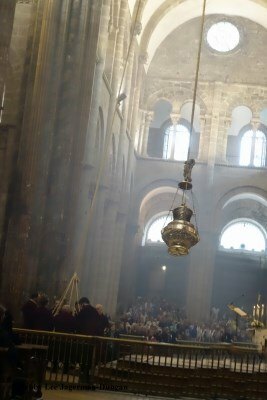 While an organ plays in the background the “Hymn to Santiago,” eight men called tiraboleiros, pull at a rope in a precise pattern and rhythm so that the Botafumeiro swings from one end of the Cathedral to the other. In only a minute and a half, the Botafumeiro reaches a speed of 42 miles per hour. 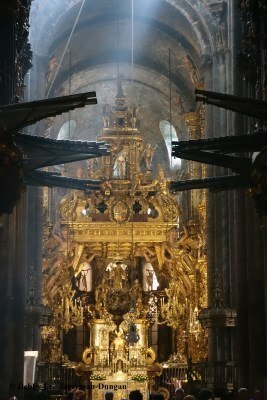 While the current Botafumeiro, translated as “smoke spreader” in Galician, is dated from 1851, the burning of the incense of long, long ago was used to purify the air of the Cathedral from the arriving Pilgrims. Today, the entire tradition is one that should not be missed. Between the music, the smell of incense, the buildup of the swinging Botafumeiro to its top speed, and the sense of accomplishment one feels during these moments, I looked back on my 482-mile, 42-day journey, and despite the 2 blisters, I felt very proud of myself! 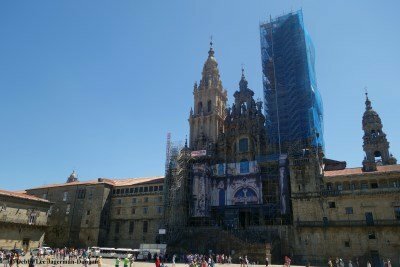 Although my journey to the Cathedral in Santiago de Compostela on the Camino de Santiago had concluded for me, I had two more journeys to accomplish before I left Spain. 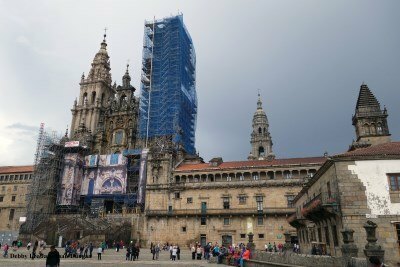 One was to take five more days to walk the 20-mile Camino Finisterre to Muxía up Atlantic Coast of northwestern Spain, and relax on the beaches. And the other, to start my journey of my life-after-the-Camino. P.S. 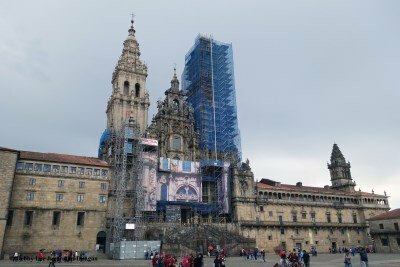 The Cathedral was undergoing some restoration during my time there. 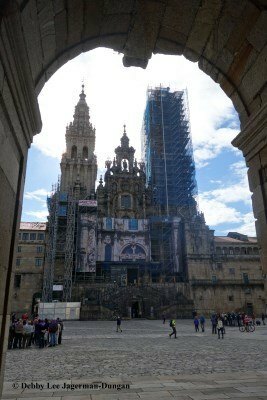 For more blogs about my 502-mile, 47-day journey across northern Spain and up the Atlantic Coast, please visit my Camino de Santiago category. 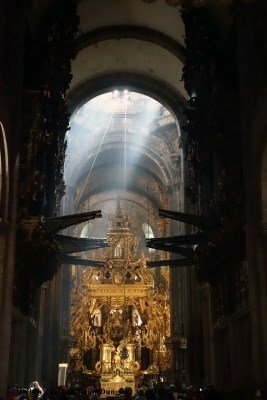 This entry was posted in Camino de Santiago and tagged Camino de Santiago by debbysdepartures. Bookmark the permalink.